There are some visitors’ responses at the bottom of the page. It is a brave bottle of wine that dares to go out into the world these days with its arse showing. Ever since the supermarkets (with Sainsbury’s in the vanguard) started covering up such bare-cheeked effrontery with another label to match the one on the front, we have come to expect a back-label as the norm. Not only does it look as though whoever is trying to selling the wine to you has made a bit of an effort, but it seems only polite as well, since it offers the chance of telling you rather more about precisely what it is you’re buying than the front label does.Indeed, there’s almost a contemporary faux pas to be made at a wine-trade tasting in twizzling round the bottle of Chassagne-Montrachet to see how long it had sat in that oak that it’s now covered in, and discovering – before the diffident gaze of its producer – that its backside is bare. So back-labelling seemed a blow for democracy when the supermarkets began slapping their own labels on any European wines whose producers had been careless enough to let them out half-dressed. Except that, inevitably, as the retailers feel that the wine-buying public is becoming more confident and more specialised in its tastes, the information being offered is turning from succinct summaries of the winemaking process to a cascade of wine-writers’ dipso-babble. My own recent favourite was the Touraine Sauvignon that invited one to discover ‘a hint of white chocolate’ on the palate when all it actually had to offer was unripe acids.Then there are the food suggestions that lurch from the hopelessly broad-brush, like the Portuguese red that ‘will accompany almost any fuller-flavoured dishes, for example, roasts, barbecue, cheese, pasta and vegetarian’, to the pointlessly pedantic. A Bordeaux Sauvignon claims to be ‘a good match for sushi and shellfish and ideal with all types of fish in creamy sauces, Chicken Véronique or Chicken Caesar salad’. There’s posh. I am surrounded as I write (it’s been a bit of a weekend of delicious thirst-quenching) with empty bottles that insist they would have gone variously with ‘canapés’, ‘appetisers’, ‘fish’ and that old standby ‘cheeses’, as if all these categories of food were not each capable of throwing up a challenge that would stop the wine in question in its tracks.There is also a bottle of Alexandre Bonnet champagne that gives its grape composition, regional derivation and the dates of its cellaring and disgorgement on the back. It is an object-lesson in informative concision to which others – if only they could shut their traps long enough – could well do to learn from. Generally I agree wholeheartedly with your comments. However, I have appreciated some of the more unusual ideas for food matching I have come across (I once bought a North-East Italian Merlot that specified particular types of offal – sweetbreads if I remember rightly) which even when questionable have at least inspired a few meals. I also quite like it if the label is written in the language of the country from which the wine originates, a little practice at translation never coming amiss, or for that matter if it’s been translated into English very badly. With so many people having access to the internet I think that one of the most helpful devices is to provide is a website address. That way not only can they give us food matching advice but they can even give us local recipes, and for the real wine anoraks amongst us, can give details of yields, altitudes and dates of harvest. I confess I rarely use the specific food-matching suggestions, which as Stuart argues, are usually too general: “great with fish” or “great with cheese” is just too simplistic: goat’s cheese? cream cheese? blue cheese? cheddar? I defy any wine to match all four! A local recipe is a really nice idea – and not one I’ve come across. Having a specific suggestion and recipe for a Spanish dish to go with that bottle of Rioja or Albariño would be a much better use of ink and paper! Love me or hate me, Ali, I always try to give good shouty. I’d be delighted to know what wine is thought best to go with me, by the way. Anybody who says anything Australian will be treated to total ignoral. A pity about your embargo on Australian wine as your accompaniment, Stuart. In view of Daron’s comments the obvious one is Little Boomey Petit Verbose (Tesco £5.99) – awarded Top Trophy at the Adelaide Show. Many thanks. I even think I’ve recommended this myself somewhere. For once I agree with you, but the only reason I can see for the article is to encourage debate. I am sure that all wine-pages readers (by sheer virtue that they have visited the site) realise that back labels are generally marketing products that are of no great interest to someone with more than a passing interest in wine. It is pretty much irrelevant that the food/wine pairing does not go together, as the consumer will think it does as they have been told it will. How many blind tastings have you been too when the speaker asks the audience to guess the region of origin? Someone offers up Italy, the speaker replies with South? Yes, do you think it may be Puglia suggests the speaker. Yes says the taster. The speaker identifies the wine as being Pinot Noir from Oregan People (however knowledgable) will generally believe what they are told as they have no reason not too. I have seen people really enjoy a Spatlese from Germany with their Grouse. All down to personal taste once again. To extend your point, on a recent research trip to Australia, I could not count the times a cellar door member of staff thrust the winemakers tasting notes under my nose and tried to make me read them. The fact that I had book in hand and was quite happily making my own tasting notes (and not marketing ones) didn’t seem to matter. I suppose they are just doing there job as they have been trained to do, so no offence to them as most did a great job. Stuart is now on holiday. I agree that a) many more “sophisticated” wine-lovers will pay little attention to the back label anyway (impossible on most French AOC wines of course), and that b) it’s all just marketing and so we shoud accept it: wine is a consumer product, consumer products need marketing, ergo back labels. But there is an opportunity there for some meaningful, creative, useful marketing info rather than the various silly/useless/vague examples cited by Stuart. Stuart asks whether back labels “really tell us anything worth knowing” and answers his own question by saying they certainly can do. Not much controversy there then. He shows some back labels are useful and some aren’t, some have meaningless marketing drivel, others winemaking details to excite the geek. I am a big fan of back labels. They are a way of giving information that cannot be squeezed onto the front label. 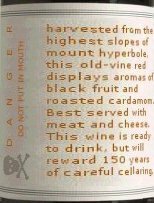 I like the well-designed back labels on supermarket wines that use symbols and text to explain the wine in a standard way to non geeks. Another useful function of back labels is to carry country specific information. A winery can use a front label – which is the corporate image – which remains the same in all markets. Then different back labels can be affixed for each market containing descriptions in the language of that country and the legal and other information needed by that country such as bar code, recycling logos, health warnings etc. I’m sure if Stuart was living in the USA he’d prefer to buy his Mouton-Rothschild with its classic label unsullied and the nonsensical Surgeon Generals health warning on a separate back label where it can be ignored. And then there’s instances where the back label is actually the front label. I bought a case of ‘Clos de May’ where its classy front label contains just the name and logo. The back label has all the messy legal stuff, alcohol level, bottle size appellations etc. A similar thing happens in Wales. Since the Welsh language isn’t legally recognised for wine labels by the EU a small plain label contains all the required information in English and is officially the ‘front’ label while the big label with a picture and Welsh text is the ‘back” label. But we know which label faces outwards on the shelf. It’s easy to scoff at food matching suggestions. I am a sceptic on the subject but there is no doubt that many people are worried by food & wine matching and appreciate suggestions. I particularly liked Sainsburys Wine & Recipe Selection range which has a recipe and a picture of the finished dish on a label that is easily peeled off to be stuck in a recipe book. My favourite label design is by California’s Ridge Vineyards which show the precise percentage of each variety in their field blends (even though not legally required to), have winemakers notes and winery philosophy. Of course, since they use just one very wide label, no back label is involved. Peter, you make many good and powerful points, and the examples you cite make a lot of sense. I think all the arguments for market-specific back labels that reflect local market language and culture makes perfect sense for example, as long as they don’t just translate “great with meat” into a dozen tongues :-). Peter runs a cracking little wine label site where some of the examples in his reply can be seen. Its at www.winelabels.org. Stuart Walton is spot-on with his analysis of back label blather. This phenomenon, which is mostly found on New World back labels, is ridiculous, and should be banned. In the best of cases, the back label blather gives us insight about the psychological make-up of a particular winery owner; however, in the worst of cases, which are predominant, this nonsense rides the farcical wave of wine-gibberish. My own personal favorite from a wine bottle long since forgotten, recommended the contents of the bottle with everything one could possibly eat. That was brilliant. This back label problem however is typical of a cultural cerebral shut-down which is occurring on many levels in our culture (Anglophone?) today. One has only to visit any bookstore in California to find dozens of various “Dummies’ Guide To . . .” or “Idiots’ Guide to . . .” and, yes, there are guides for wineconsumers! Regarding the back labels, how nice it is not to have to think about what would go best with wine X. How wonderful it is entirely not to have to think at all. I quite agree Geoff. Back label blather is all part of that culture in which, as the means for communication have continued to expand, the individuals using them have less and less to say to each other..